And he’s right. Recipes using ground beef are few and far between around here. We almost exclusively use ground beef for burgers. I grew up eating it several times a week so I got my fill for a long while. Jason never tires of it. Besides burgers, he loves a chunky meat sauce (where ingredients other than ground beef are completely optional). Even the leanest grind is budget friendly. We tossed non-burger and non-meat sauce ideas back and forth before settling on Dirty Quinoa, a twist on Dirty Rice. Jason had sampled quinoa for the first time last week and… well, he didn’t hate it. And anytime I can get him to to utter the phrase, “it wasn’t completely terrible” about a food as healthy as quinoa, I see it as a challenge! If you’ve never eaten quinoa, I think it has a taste that’s pretty comparable to brown rice. And like brown rice, if I put enough stuff in it, everyone will eat it 🙂 We served Dirty Quinoa (topped with some chopped roasted red peppers for a little color) along side a tangy coleslaw and roasted carrots for Fat Tuesday. 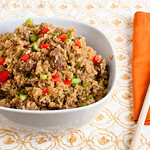 A healthy twist on dirty rice. Brown lean ground beef in a non-stick pan over medium heat until mostly browned. Add 1 Tbsp olive oil to the pan and add onion, celery, and bell pepper. Stir frequently until the vegetables begin to brown. Add garlic and white/light green parts of the green onion. Stir and cook for another 2 minutes. Pour in quinoa and stir to mix. Add cooked ground beef, chicken broth and bay leaf. Bring to a boil and then cover and simmer for 30-35 minutes, stirring occasionally) until the liquid has been absorbed. Season to taste. Serve topped with green onions along side your trusty bottle of hot sauce. This recipe was developed for the Texas Beef Council. As part of the Foodbuzz Tastemaker Program, I was reimbursed for the ingredients used in this recipe. I love quinoa, and this is one way I haven’t made it before! Looks delicious! Ironically enough, quinoa is actually the ONLY whole grain my parents are okay with eating. I’ll never understand how we’re related. I do love the stuff and this dirty rice sounds super delicious! With all those whole grains, it’s not so dirty anymore! This looks delicious! I have never had quinoa and must try it. Quick question–at what point do I add the cooked meat back? Do I add it with the quinoa? thanks! @connie, oops! Yes, add the beef back to the pan when you add the quinoa. Can’t wait to try this. 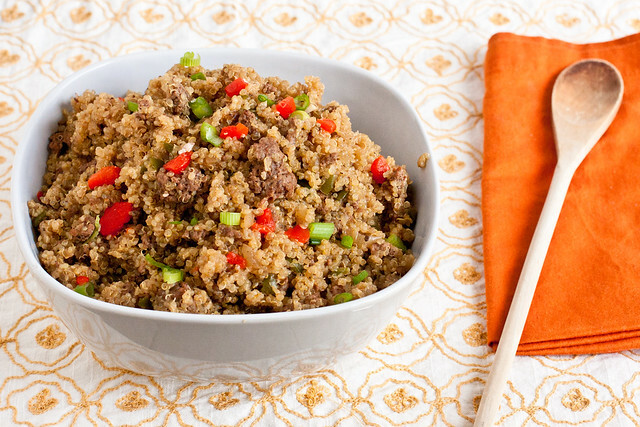 We eat (mostly) gluten-free and love quinoa. This recipe looks great! Thanks! Love the name of this. Dirrrty! 🙂 I’ve got a bunch of quinoa to use up and this is making the list! Since I started buying my meat almost exclusively from the farmers’ market, I am always on the lookout for ways to use the cheaper cuts of meat. Thanks for this! I tried this and loved it! I’m actually planning to post it on my blog (www.mimisfitfoods.com) tomorrow. I’ve figured out all the nutritional information and will post it alongside the recipe. Thanks for the deliciousness! YUMMM!! My husband and I tried this recipe and LOVED it! Thanks so much! This was great, rave reviews. Added some crushed red for more color and spice. I work on a farm and have a ton of ground beef from our grass fed cattle. I was looking for something new and came across this. I have made this three times so far.. minus a few things because my family isn’t really into the peppers or celery.. but they love it. My two year old goes nuts for it. It kind of tastes like a much improved version of hamburger helper. I know that sounds weird but has an old school flavor to it that we all love. Off to make it right now. Yum. It really doesn’t translate into a slow cooker-kind of meal. But, if you buy “quick cooking quinoa,” (usually 10-15 minutes to cook) instead of “regular quinoa” (usually 25-30 minutes to cook), you can cut the cooking/simmering time in about half. I’ve made something very similar in my rice cooker. I just added all my ingredients together and cooked it up in my rice cooker. Just have to open it about halfway to give it a good stir. Is it ok to substitute ground beef with ground turkey?